In January 1941 the RAF changed its tactics against the Luftwaffe and began what were known as 'circus' operations. These consisted of sending a force of bombers, escorted by a large number of fighters, to attack targets in Northern France, with the aim of drawing German fighters into combat in circumstances favourable to the RAF - much the same tactics that the Luftwaffe had employed in the early phases of the Battle of Britain. The first such operation took place on 10th January 1941, when an airfield near Calais was attacked. Unfortunately, the RAF experienced many of the problems which the Germans had in the previous summer. The 'circus' operations involved complex planning and intricate co-ordination with the bomber units acting as 'bait' to draw up the German fighters, which proved to be of a relatively high standard, led by veteran pilots who had fought over Spain, France and Britain, and some of the earliest 'circus' operations suffered unnecessarily high casualties, and had little to show for their efforts. "In the meantime the formation had proceeded inland and appeared to Blue 1 to be moving in a large circle for some time. Owing to the ground being covered with snow it was difficult to say where this was. At about 1305 hours an ME 109 suddenly pulled up in front of Blue 1 who turned and another ME 109 went past having come down in a dive to attack him. Blue 1 saw another ME 109 closing to attack Blue 2 (Sgt Orchard). Blue 1 (S/Ldr Saunders) called on the R/T and warned Blue 2 and then made to attack the ME 109 who immediately turned away. Blue 1 attempted to climb up to several ME 109s but these evaded him. Blue 1 then saw what he thought was Blue 2 in a dive going towards the coast and instructed him on the R/T to return to base. Blue 1 then lost sight of Blue 2 and finding himself short of petrol returned to England Landing at Manston to refuel at 1330 hours and at base at 1340 hours. The remaining 9 Spitfires had landed at Tangmere by 1350 hours." 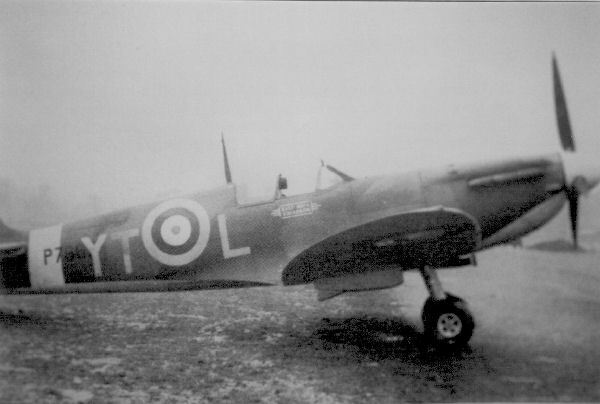 Fw Philipp, 4/Jg 26 claimed a Spitfire at Neufchatel-Hardelot. Pilot Officer Hill survived and was taken prisoner. 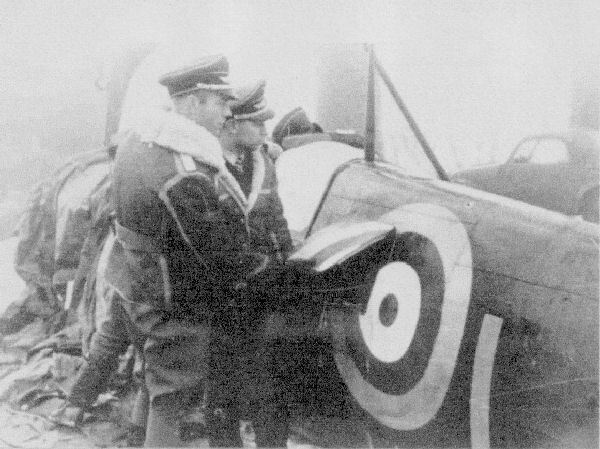 Germans examining a spitfire of 65 squadron on 5th February 1941. This is probably Hill's plane as Harold Orchard's crashed into a hillside, and would have been more damaged. 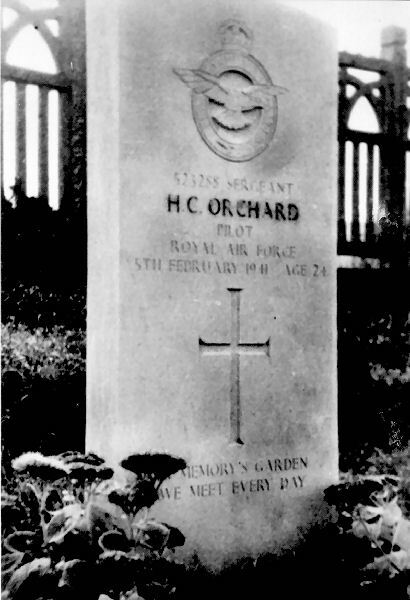 Harold Orchard's body was recovered, and he was buried in the village cemetery at Neufchatel, a few miles south of Boulogne, in a grave now marked by a War Graves Commission headstone, appropriately carved from Portland stone. 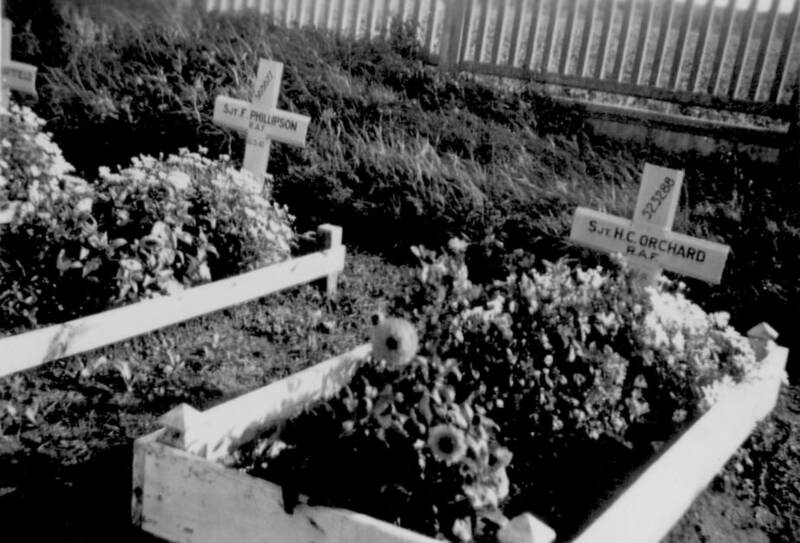 Harold Orchard's grave at the end of the war. 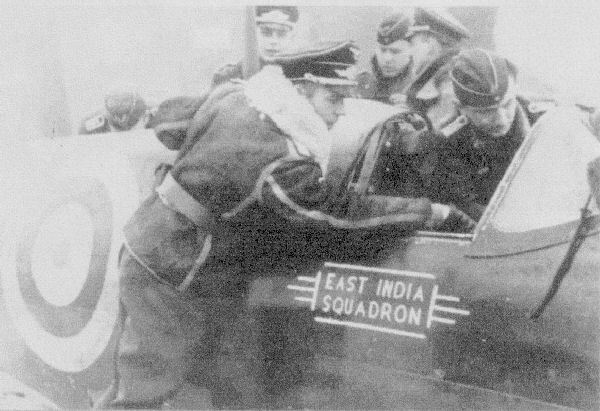 65 Squadron continued to be in the front line of combat throughout the War. For a time it operated with the US 8th Army Air Force, escorting the Flying Fortresses on daylight raids over Berlin. Before D-Day it was re-equipped with North American Mustang fighter-bombers, and after the invasion operated from a series of front-line airfields as they were captured from the Germans. It was credited with having destroyed 1000 enemy vehicles in two months. 65 was stationed near Brussels for a time, and supported the ill-fated Arnhem campaign, returning to England towards the end of the war, from where it escorted RAF bombers on raids over Norway, Denmark and Germany. In June 1950, it was equipped with Hornets, and based at Linton-on-Ouse, forming part of the Air Defence of Great Britain. Footnote. In 2007 I was contatced by a member of a French team of archaeologists who had excavated the remains of Harold's plane from the hill near Neufchatel-Hardelot. 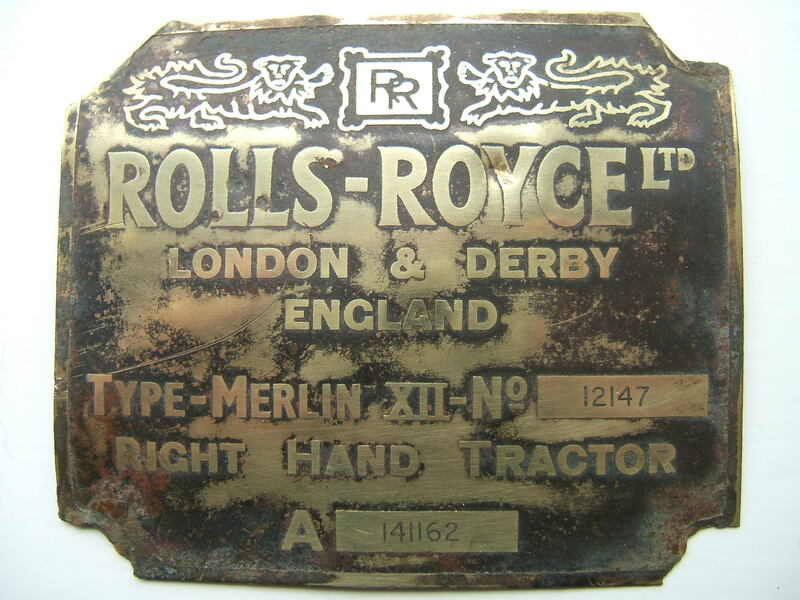 Subsequently I was delighted to be given the Rolls-Royce licence plate from the engine of Spitfire MkII No.P7733.